He Zhihong, a national of the People’s Republic of China, was one of eight Chinese women working with UN Police for the UN Stabilization Mission in Haiti (MINUSTAH). Born and raised in Yunnan Province, Zhihong was part of the “Naxi” minority ethnic group. She obtained her Bachelor’s degree in English education from Yunnan Normal University in 1998 and subsequently served in the army as a frontier checkpoint officer with the Yunnan border police. In her 11 years with the border police, Zhihong was promoted several times for her outstanding performance and was awarded the First Class Merit by the Chinese Ministry of Public Safety and Security. Zhihong had always been attracted to peacekeeping. When she heard in the Chinese media that the government was recruiting peacekeepers, she swiftly submitted her application. Although her son was only a year old at the time, the appeal of helping children in need outweighed her personal concerns. After going through a rigorous selection process, she joined MINUSTAH in December 2007. Her first mission lasted eight months and along with her fellow Chinese colleagues she was awarded a peacekeeping medal by China upon completion of the mission. In June 2009, she returned to Haiti for a second term. “She had a caring, tender heart and devoted herself to our peacekeeping mission,” a fellow Chinese police officer said. “She was down-to-earth, modest and honest,” recalled a former colleague. Zhihong spoke English fluently and served as interpreter in meetings between the Chinese police and delegations from various countries. According to her colleagues, she was hard-working and well-organized. 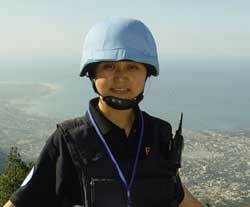 As head of the eight Chinese female peacekeepers, Zhihong treated the rest of the team as her sisters. When a team member was hospitalized once, she offered to look after her, sending her meals daily and washing her clothes. Two weeks later, Zhihong contracted the same illness, but her first concern was her work at the office and whether her illness might affect her colleagues. Besides her official duties, Zhihong also acted as a cultural ambassador in Haiti. She initiated weekly Chinese classes for local Haitian students focusing on the Chinese language and culture. In addition, she organized soccer games between her Chinese colleagues and fellow peacekeepers from other countries. Known to many by the name of “Catherine,” Zhihong was keen on improving her knowledge about Haiti. When she heard about the 12 May 2008 earthquake in Wenchuan, China, Zhihong and her family were among the first to donate more than 1,000 dollars to the victims. Zhihong is survived by her husband Zheng Tao, her four-year-old son, her mother Mu Yisheng, her father He Xiejiong, her brother He Zhiyu and her sister He Zhiqian.